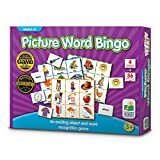 Even before my daughter could put the sounds of words together, she loved playing with words! 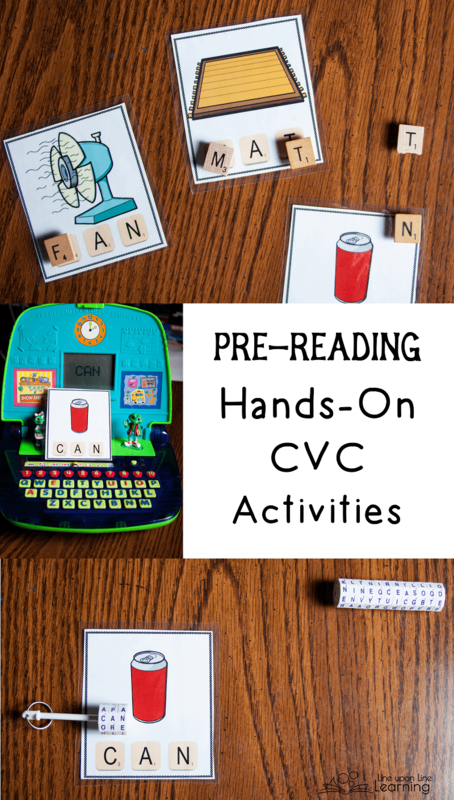 As the months have passed, she’s become more confident in reading CVC words and these CVC activities are favorites we return to time and again. Strawberry extended her letter tile play from my ABC letter tile template to learning consonant-vowel-consonant using CVC cards and recognizing sight words using sight words cards. She loved finding the “correct” letters amid the entire collection of letter tiles. Even when she could not read the word on the card, the image gave her a clue. Putting together words using letter tiles gave her hands-on literacy practice, even before she could read. We own a simple Letter Factory computer called “School-Time LeapTop.” Strawberry loves to play with this computer and put words together. One of the settings will read back a three-letter word when she types it in. Strawberry asked for more “word cards,” because she loved the surprise when she found out what word she was holding in her hand. Of course, the cards with an image eliminated the surprise. She still loved feeling “smart” as she spelled words! We also have a variety of other letter play tools, such as the Word Spin , which keeps the letters together in a word with a magnet. In addition to using word cards to make words, Strawberry would also spin the letters around and then come ask “What did I spell?” Of course, some of these invented words were hard to read aloud! 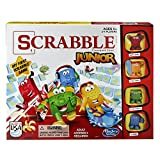 Here are more word games to enjoy! Now that Strawberry is able to put letter sounds together to begin reading, learning consonant vowel consonant words are the perfect step. She can sound out the words using first sounds and feel proud of her reading accomplishments! The clip cards are fun (she loves that some of the pictures are “wrong”). Manipulating the clothes pin is a challenge as well, providing great fine motor skills practice. Strawberry loved the puzzles as well. 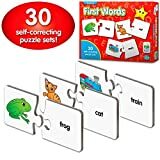 She obviously has some difficulty with letter reversals, but the images helped her figure out what the words were and the puzzle guidelines likewise helped her determine how the words were spelled. Perfect for her level! Here are some other favorite word puzzles we enjoy. My daughter also has been quite interested in rhyming lately, so a natural extension is sorting words in to word houses. We colored in the images and sort them in to the right houses together. 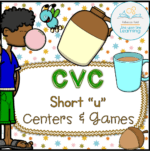 What fun it is to open the windows and see the CVC words hanging out together! 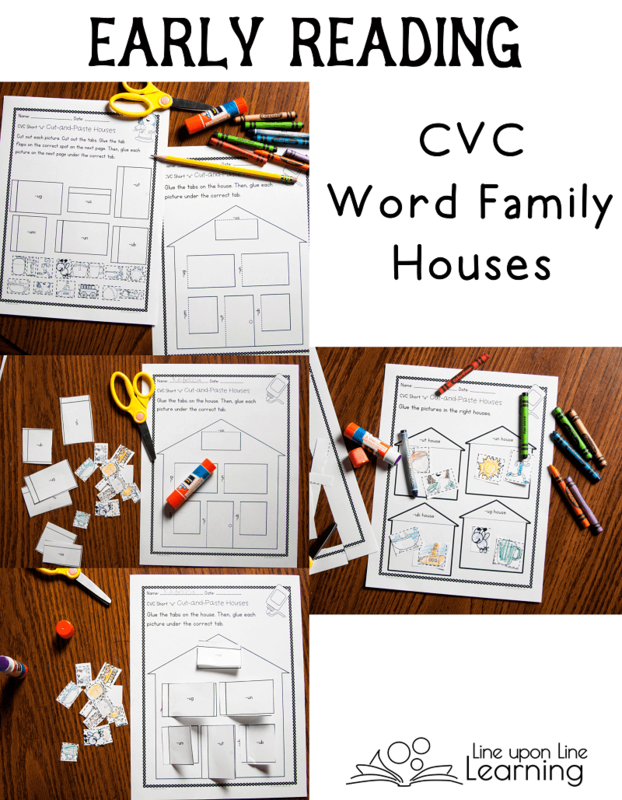 I like how we can focus on one short vowel sound at a time with these word houses. Soon she’ll be ready for mixing up words, but for now, it’s nice to keep the vowels clearly understood. See also our recent spring-themed flower word family sort. My daughter is not ready for this activity yet. She has very limited writing skills. But, I know that once she is a little more confident in writing, she’ll love figuring out each of the words. 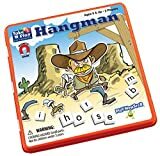 There are even two different versions of the Write-the-Room early reading activity: one with the middle vowel included on the task cards (under the images) and another with all three letters missing. Thus, we can return to it twice at different times of the year. It’ll fit different, incremental stages of her early reading journey. The bundles of kindergarten reading activities are currently available by short vowel bundle and as a full set complete Mega bundle. You can get these at three locations. 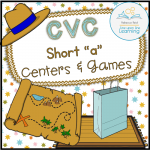 If you like these CVC Centers, you may love the hilarious silly CVC sentences activity!